Do you find difficulty giving training your dog? So, Innotek SD 2100 is the right product for you. Let’s give a look at our Innotek sd 2100 reviews. 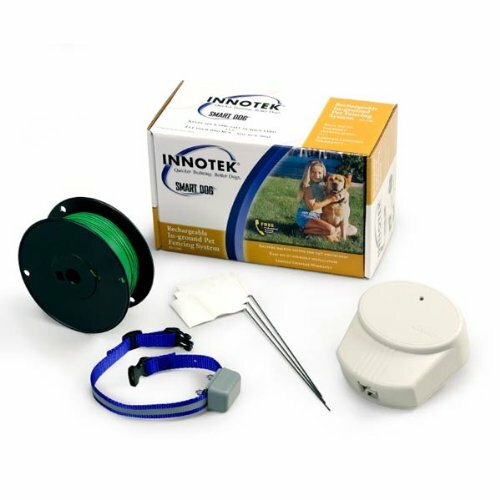 Innotek Sd 2100 rechargeable in ground pet fencing system has the latest features in affordable price. This dog fence has the minimum price in the market with a rechargeable Collar. Along with the powerful transmitter and the built-in battery. With all needs of a dog fence and with the affordable price sd 2100 bought much more Features than sd 2000. 1 Whom is Dog Fence System Suitable for? Whom is Dog Fence System Suitable for? One or more dogs of the same size, and you’re in the market for an affordably priced DIY dog fence. It is dependable and convenient to use. But, if you have more than one dog, and that too is of different size and temperaments, then I would say this is not for you! Because you are not going to set the correction level of the collar, you will set in the transmitter. Every dog on this system gets the same level of electric stimulation; there’s no way to tailor the correction level to each dog. What's Included with Innotek SD-2000 System! The collar takes a long time to recharge. People who used Innotek Sd 2100 has declared it as a money worth dependable in-ground dog fence. This fence costs about $35 more when compared to its predecessor, the SD 2000. But features like a rechargeable collar, low battery warning and built in battery backup more than makeup for that price difference. It takes between 12-14 hours to fully charge most people just leave it on the cradle overnight. The average charge lasts between 2-3 months, and there’s a low battery warning light that lets you know when it’s time to charge the SD 2225 dog collar battery. The SD 2225 is rechargeable, and people loves the most about this collar. You don’t need to on, or off the switch, once you take the collar off the charging cradle a green light will appear which indicates you, it’s fully charged and ready to use. If you find a break in your wire can be a great fuss. A 20g wire which is with the fence kit is slightly narrow and can vulnerable. To reduce the possibility of wire breaks, almost everyone upgrades to heavier dog fence wire at the time of purchase. If the power goes out, and your fence stops working it’s as simple as that. The good news is that the battery backup on this in-ground fence keeps the Innotek Sd 2100 running even if there’s a power outage. It can cover up to 25 acres and important safety features like to run through Prevention and Over Stimulation Protection. Can contain an unlimited number of dogs providing they each have their receiver collar. It is a good option if you have dogs of the same size, and you’re in the market for an affordably priced DIY dog fence. You are going to have fun because it is dependable and convenient to use. People who give a review on this collar, most of them have said about this underground dog fence is that “it is uncomfortable for a dog which is under 10 lbs (4.5 kg)”. The manufacturer said it’s suitable for the dog which weighs over 5 lbs (2.3 kg). Battery Backup: If the power goes out your fence stops working it’s so simple as that. The good news is if there’s a power outage, the battery backup on this in-ground fence keeps 2100 running. The bad news is that for this system’s battery backup to work you have to install 8 AA batteries. Some people said that the batteries have to be changed quite often, and this-this is going to make it bit expensive. Charge Reminder: Allows you to set a 30 or 60-day reminder to check the charge on your dog’s electronic receiver collar. Because the collar itself has a low battery warning light and some people didn’t bother to set this reminder. If your dog has dark hair or likes to play outside at night, then the best part is, it has a reflective stripe on it which is a good advantage! Most people say the strap’s cloth material is long lasting but if it does fray, you just simply needs to transfer the receiver unit onto any non-metallic collar of your choosing without replacing the entire collar. Do your dog often loves to play with water? So, here is the solution. As I said before, most of the people who wrote a review on the SD 2100 were able to find a sufficient level of static correction for an average dog. This is one of the most modern electric dog fences available which is easy to use and we consider it one of the most reliable systems in our range. This dog containment system represents great value for money.